Robeson County is located in southeastern North Carolina. The county is noted for its large American Indian population and also for its level of impoverishment. The county seat is Lumberton. 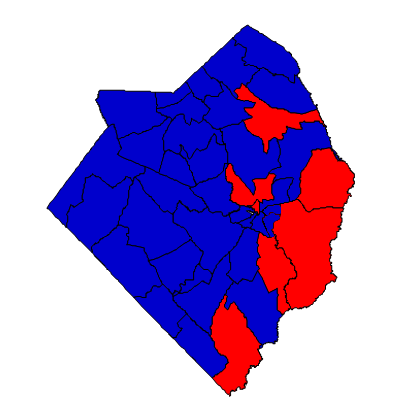 Historically, Robeson County was one of the strongest Democratic counties in the state, with a powerful political machine that endures in the modern era. Lumberton is the site of the University of North Carolina at Pembroke, a historically Native American institution. Mike McIntyre, U.S. Congressman from the 7th Congressional District, is from Lumberton; however, redistricting has placed McIntyre’s home into the 8th District, represented by Republican Richard Hudson. Only a number of precincts in northern Robeson County remain in the 7th. Racially, Robeson is 38% Native American, 29% White, 24% African American, and 8% Hispanic. Forecast: Robeson is still overwhelmingly Democratic, but not as much as in past days. Many white ‘Dixiecrats’ no longer vote for their party, especially at the federal level. This was particularly pronounced in 2008 during Barack Obama’s first run for President. Obama actually improved on his margin of victory in Robeson County in 2012, but this was due to increased turnout from African American voters. Republicans can come close, like they did here in 2004 (Bush vs. Kerry) and 2010 (Burr vs. Marshall). But ultimately the white composition of the electorate is too small for them to win outside of extraordinary circumstances. Hillary Clinton would run strongly in Robeson, doing much better with white voters than Obama. Native American issues are also key in this district, and the issue of federal recognition for the Lumbee Tribe is potent. Demographically, the county looks gloomy for Republicans. White Republican support has probably peaked and is likely to drop off, and whites are also moving out of the county. The growth rate during the 2000s decade was 8.78%, which is surprising given Robeson’s reputation for poverty. Whites composed 36% of the electorate four years ago, the Obama machine has whittled this down to 32%. OFA also used UNC-Pembroke as a rich source of Democratic voters. In 2016, Democrats are likely to see a drop in turnout from African Americans and young people, while at the same time doing better among white voters in rural areas. These combined effects will probably be a wash.